All-New Ford Focus is back to its best. The all-new, 4th Generation, Focus proves that Ford is back to doing what it does best. 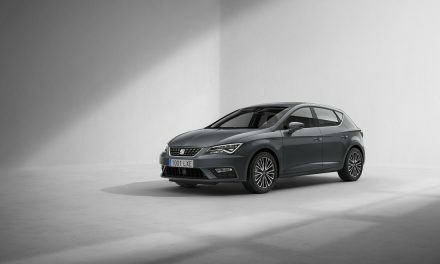 It combines all the important family car ingredients – comfort, space, safety, technology and infotainment, but the fact that it is now the best driver’s car in its class is the real icing on the cake. 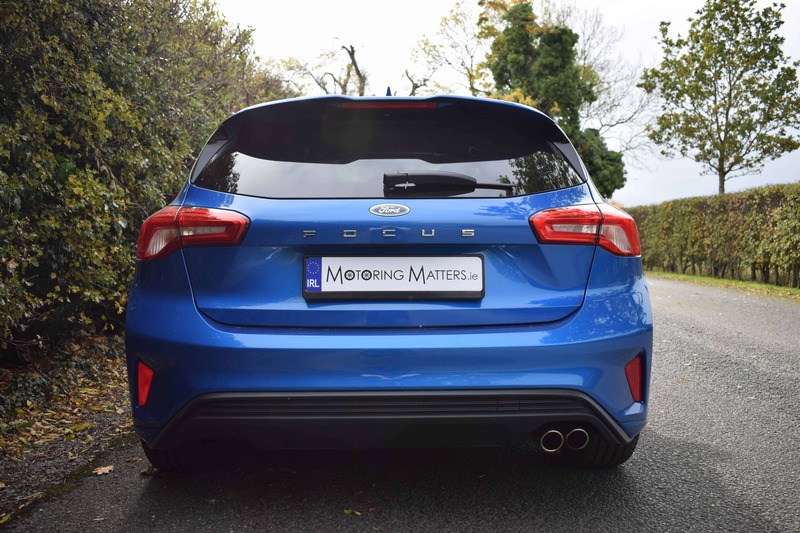 The three previous generations of the Focus were hugely successful for Ford in terms of sales volumes, and the all-new model is destined for even greater glory. 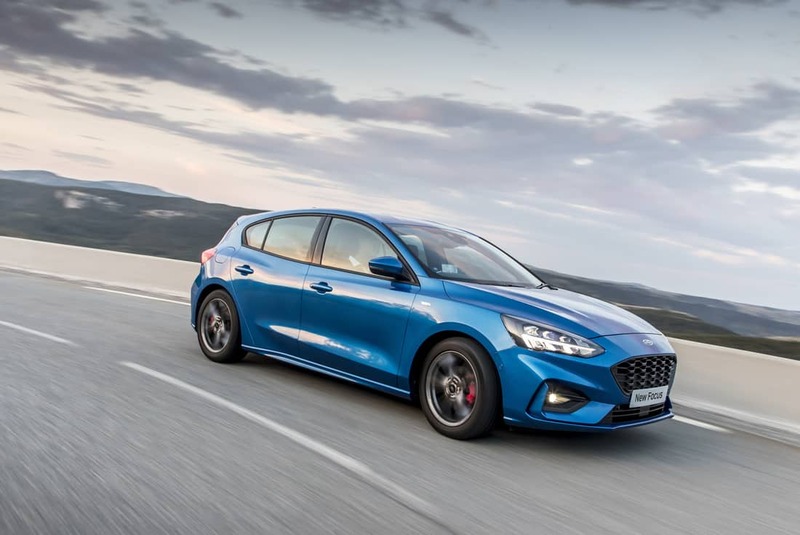 Ford claim that the all-new Focus offers “the most confidence-inspiring, intuitive and rewarding driver and occupant experience of any mid-size family car in Europe”. When Ford says the new Focus is all-new, it really means it, as no parts have been carried over from the previous car. Ford’s designers and engineers knew that they had no room for error when creating the new Focus. If the car is not practical enough, families won’t buy it. If it is not efficient enough, business buyers will avoid it, and if it doesn’t offer excellent driving dynamics, enthusiasts will look the other way. Thankfully, the new Focus is so good in every area that Ford is calling it the best car in the company’s long and illustrious history. Based on a completely new platform, called C2, the new Focus is super-stylish thanks to its neatly carved styling and dramatic flowing lines. 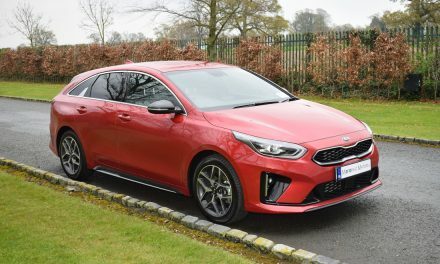 It is also fitted out with the latest in-car technology and infotainment, along with state-of-the-art safety features for true peace-of-mind motoring. On sale now, the all-new Focus is available in 2 bodystyles (traditional 5-door hatchback and cavernous estate/wagon), with an Active SUV model to follow. Four specification levels provide plenty of choice for Focus buyers, with even the entry-level ‘Zetec’ model is equipped with such standard items as a 6.5” SYNC 3 infotainment system with Android Auto and Apple CarPlay, 16” alloy wheels, LED daytime-running lights, automatic headlights, front fog lamps with cornering function, cruise control with Lane Keeping Aid, Quickclear heated windscreen, Pre-Collision Assist including vehicle, pedestrian and cyclist detection, Post Impact Braking, electronic parking brake, selectable ‘Drive Modes’, manual air-conditioning and a front centre armrest. 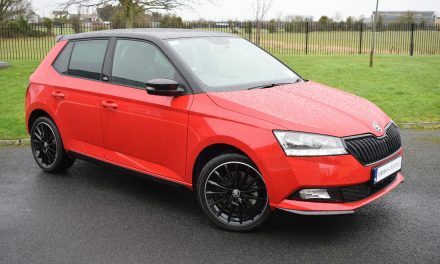 Next up is the sporty ST-Line, which adds 17” sports-style alloy wheels, ST-Line body kit, ST-Line badging on the front wings, ST-Line scuff plates, twin polished tailpipes, large rear spoiler, sports suspension (18mm lower than the standard car), keyless start, black headliner cloth, alloy sports foot pedals and interior sports trim. 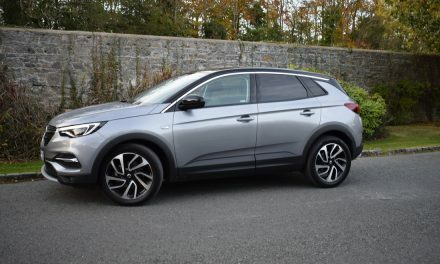 The ever-popular Titanium trim is based on the Zetec model but also includes 16” Titanium alloy wheels, power-fold mirrors, front & rear parking sensors, LED rear lamps, 8” SYNC 3 with satellite navigation, Android Auto & Apple CarPlay, keyless entry & start, ambient lighting and dual-zone climate control. Range-topping Vignale specification adds pure luxury to the mix with 18” Vignale alloy wheels, unique Vignale body styling, LED headlights, LED rear lamps, LED front fog lights, Active Park Assist, privacy glass, ‘B&O Play’ sound system, heated steering wheel, full leather seating, multi-coloured ambient lighting and a Heads-Up Display. Available as an option on other models, the Heads-Up Display projects key information in your field of vision, so you can keep your eyes on the road ahead. The clear, bright image can display your choice of content, including vehicle speed, navigation, cruise control notifications and Traffic Sign Recognition data. This extremely useful feature is the only one of its kind to be compatible with polarised sunglasses. 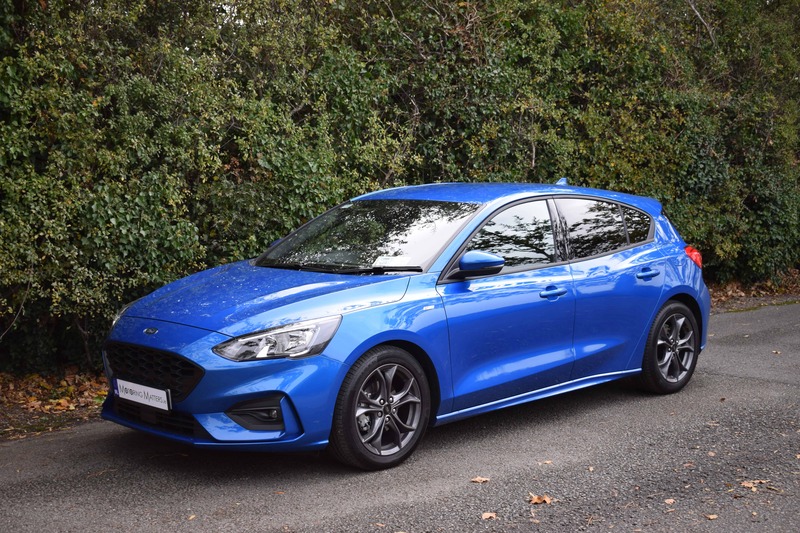 Engine choices in the new Focus include Ford’s multi award-winning 1.0-litre EcoBoost petrol engine with 125PS and a 1.5-litre EcoBlue diesel with 120PS. A six speed manual gearbox is standard across the range, while a slick-shifting 8-speed automatic is available with the EcoBlue engine. In keeping with its competitors, Ford intends introducing a ‘mild hybrid’ option in the new Focus in due course. My test car was a new Focus ST-Line 1.0-litre EcoBoost 5-door finished in stunning Desert Island Blue metallic paintwork for maximum impact. With 125PS of power and 170Nm of torque (200Nm with overboost), this wonderful engine was able to propel the car from 0-100km/h in just 10-seconds, on the way to a top speed of 200km/h (where permitted). Fuel consumption as low as 4.8l/100km is possible on a combined driving cycle, while low emissions lead to annual road tax of just €190. With the EcoBlue diesel engine fitted, fuel consumption drops to as low as 3.5l/100km on a combined driving cycle, while annual road tax drops to just €180. 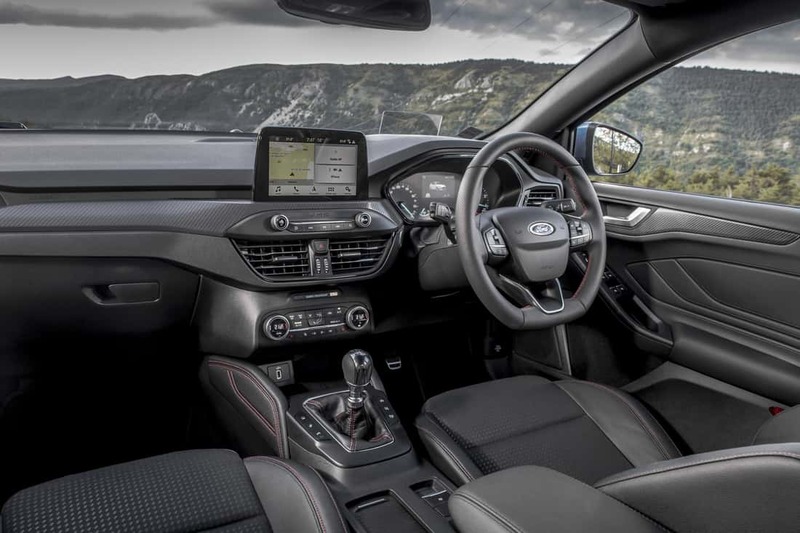 The new Focus covers ground with a sense of composure and precision that was largely absent form the previous model. It takes road imperfections and bumps in its stride, while the steering translates your every input accurately to the road to give the Focus a genuine sense of flexibility. 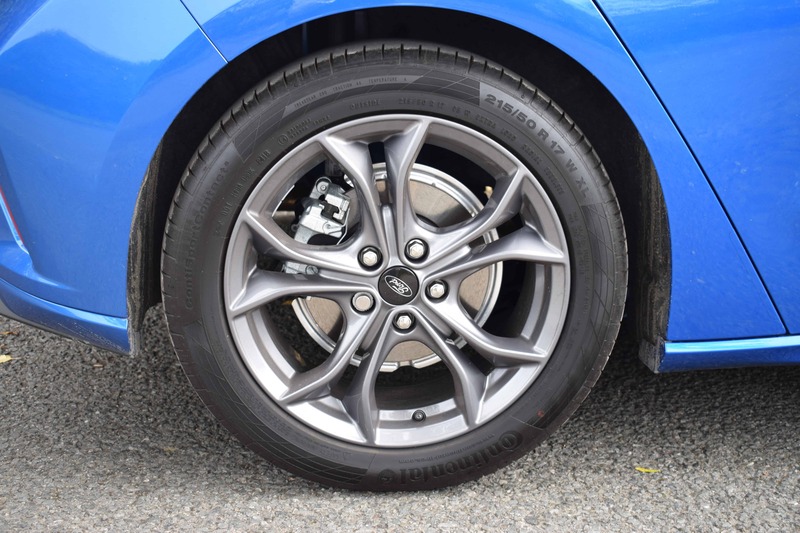 Excellent driving dynamics ensure the new Focus remains smooth and controlled at all times, while never feeling underpowered or unwilling to respond to throttle inputs. In my mind, the new Focus comfortably regains its crown as the best car in its class to drive. 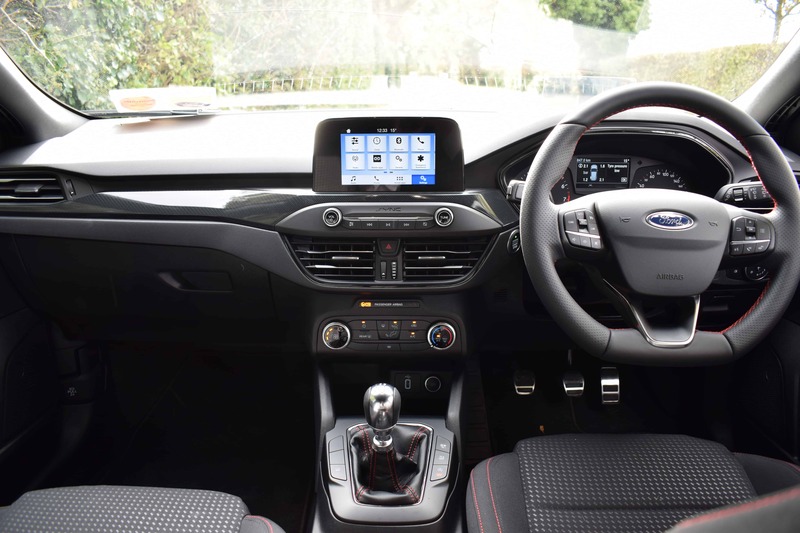 The cabin of the new Focus is a very pleasant place to be, with Ford’s bright and intuitive, dash-mounted, touchscreen providing easy control of the vast majority of the car’s functions. There are, however, still buttons and dials below the display for the audio and climate controls. Seat comfort is terrific, build quality is top-notch and multiple adjustments are available for the driver’s seat and steering wheel. 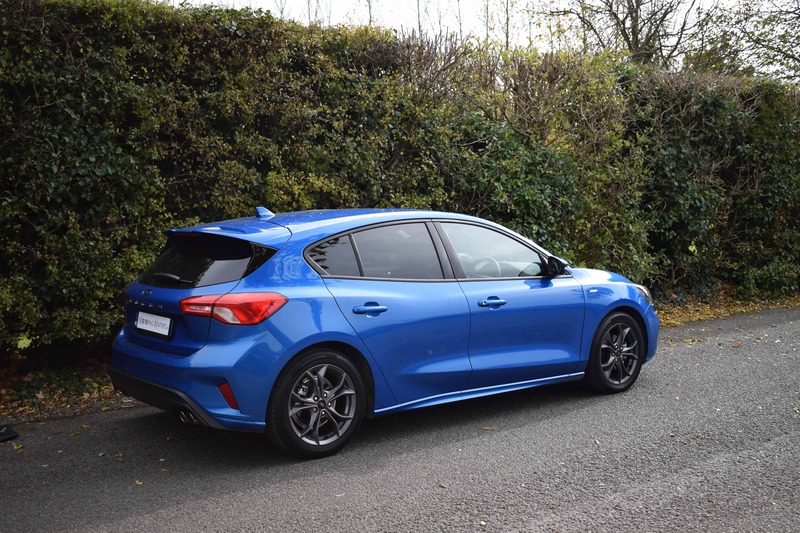 An important consideration for families looking for a new car is practicality and this is yet another area that Ford excel in with the new Focus. 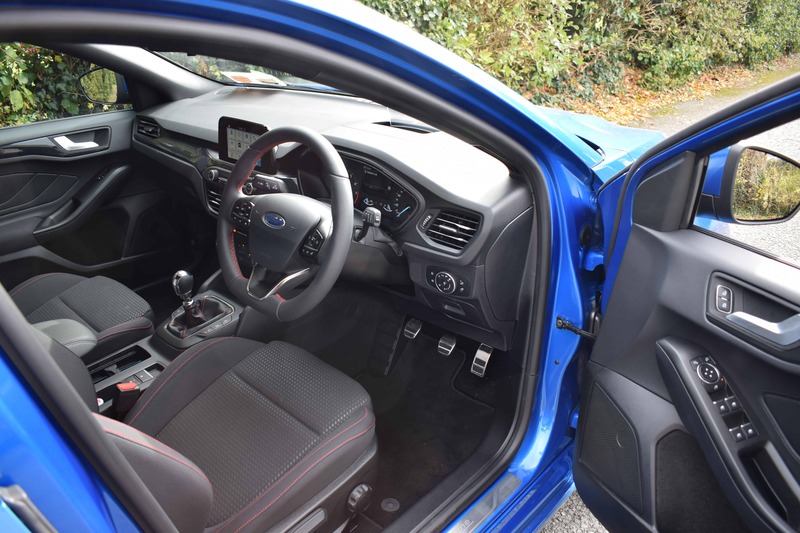 The new platform has allowed Ford to extend the wheelbase of the Focus by 53mm, while inside there are neat touches such as the raised front seats. This allows rear passengers to slide their feet beneath them, making better use of the space available. There is ample head and knee room for adults in the back, and seating three across the rear bench is possible. There are two ISOFIX points as standard, too. 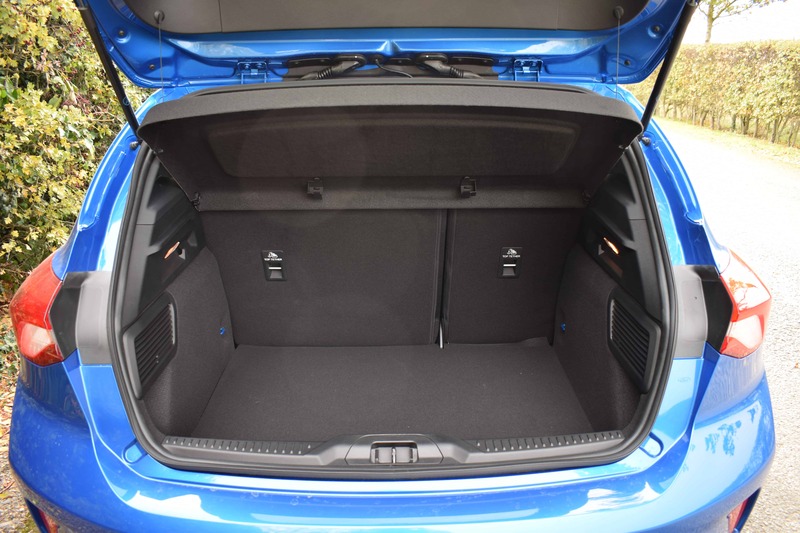 Boot space is a healthy 375 litres with the rear seats in place and extends to 1,354 litres with the rear seats folded. 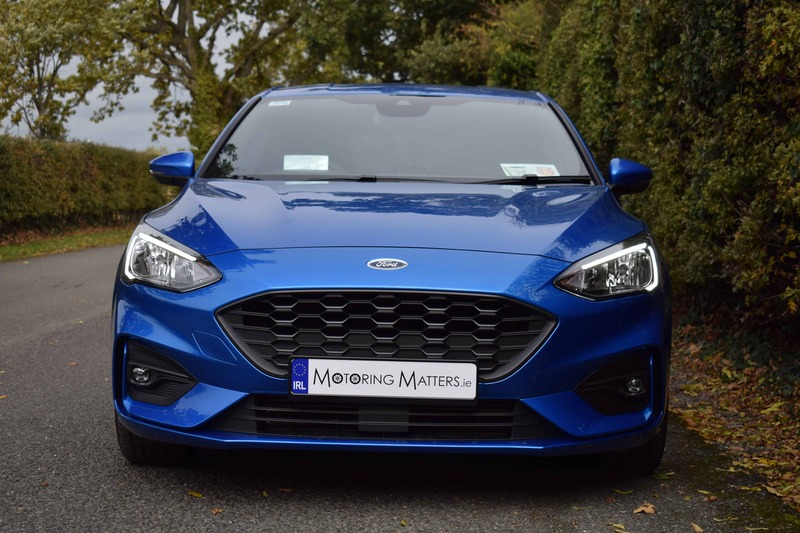 Ford Ireland have just announced revised pricing for the all-new Focus (terms & conditions apply) with a lead in price of just €22,495 (ex-works) for the 1.0-litre EcoBoost, Zetec 5–door model. 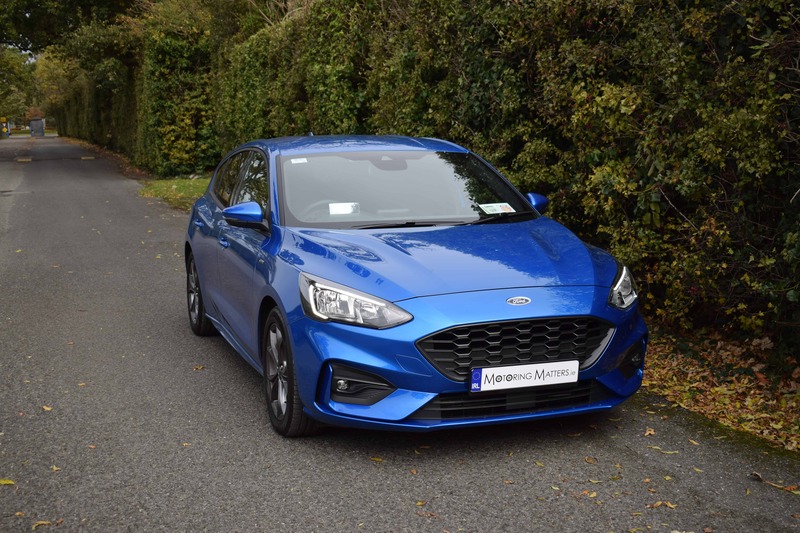 The ST-Line car I drove is priced at a very reasonable €23,495 (ex-works), with the Titanium model priced from €24,495 (ex-works) and the Vignale model starting at just €28,495 (ex-works). The all-new Ford Focus delivers more style, space and advanced driving technologies than any previous version of the car. The new Focus keeps its place at the top of the family car tree, but adds extra functionality too. In fact, the all-new Ford Focus is so ingenious, visionary and remarkable, that every car bears Henry Ford’s signature. PreviousVolkswagen Digitalises Sales Process from 2020. NextOPEL GRANDLAND X ‘ULTIMATE’ SUV 2.0-Litre Turbo-Diesel (177PS), 8-Speed Automatic.